Canadian DEN STAR Kathy Cassidy is a published author. 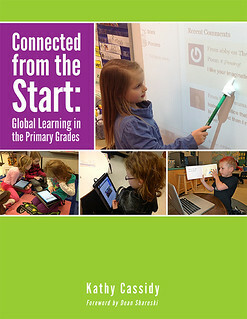 Her new ebook, Connected from the Start: Global Learning in the Primary Grades, is now available through the PLP Network. If you work with primary grade students, this book would be a great resources. Check it out! The forward is written by Dean Shareski. Congratulations Kathy! This is awesome news! OMG!! I saw this book on another site and loved it. I didn’t realise the author was a DEN member! It is amazing! !